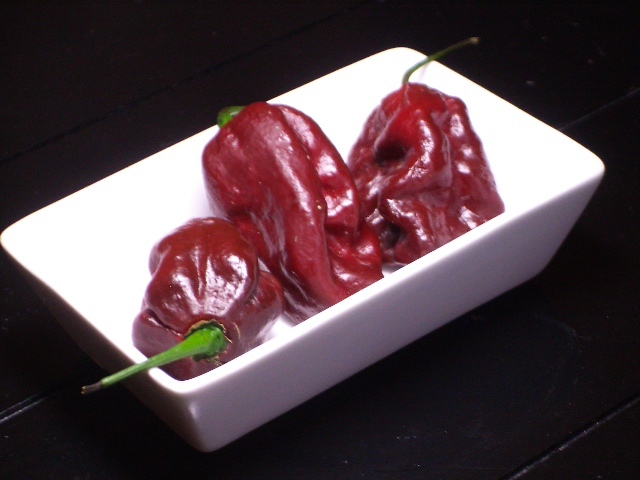 Chocolate habañeros are among the hottest peppers in the world, as are regular habañeros. Use gloves when handling the peppers, and prepare this sauce in a well ventilated environment. In a non-stick skillet, heat the olive oil and then add the onions and carrots. Cook for a few minutes over medium heat, carefully watching to make sure they don’t dry-out and burn. Add the lemon juice and the garlic, and cook for another 3-4 minutes. Once the lemon juice has mostly cooked out, add your spices. Cook for another 10-12 minutes, adding water when it starts to dry out (about 1 tablespoon at a time should do it- don’t add too much water! you may not need the whole 1/2 cup.) Finally, add the peppers and cook for another 3 minutes. Remove from the heat, and once cool, empty all of the contents into a food processor. Put the lid on tightly and add the vinegar and agave syrup. Pulse until smooth. Bottle and ENJOY!